While the OEM spent much of the Guild 21 call discussing its certified collision repair program, BMW also last week explained its views on items ranging from the high-profile topic of diagnostics position statements to the niche concept of interior trim repair. 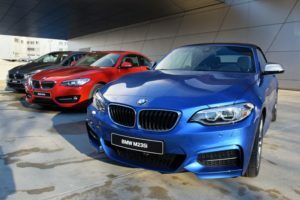 BMW doesn’t have a position statement about diagnostics and recalibration — both of which might be needed after something as basic as removing and reinstalling a mirror — BMW insurance manager Joshua Fahlbush said during the Thursday VeriFacts Guild 21 call. “We don’t have them,” he said. Instead, “those are documented in our repair instructions,” he said. BMW allows a shop to use the last seven digits of a VIN number to retrieve OEM repair procedures tailored to that specific vehicle’s configuration, according to Fahlbush. Given that, a generic position statement would indeed seem redundant and imprecise. Certified Collision Repair Centres can get those repair procedures for free; other shops can pay to obtain them through the BMW Tech Info website. Certified BMW shops must install “new OEM parts only,” Fahlbush said in response to a question about recycled parts. “Within the CCRC network it is required, strictly at 100 percent new OEM parts,” he said. Fahlbush described BMW’s position as “kind of sweeping,” and it doesn’t want alternative parts used by uncertified shops either. A recycled part, he said, was “outside of our chain of custody” — BMW has no way of knowing if it was recalled or what else happened to the part before it was brought to the shop. “We totally and truly respect alternative solutions out there,” BMW wholesale, body and paint, insurance and R3 manager Marcos Ehmann said, but he agreed “100 percent” with Fahlbush. Instead of allowing alternative parts, BMW provides a shop with support so an offer can be made “in an attractive way,” Ehmann said. It was unclear if this was a reference to BMW price cuts for new OEM parts or support aimed at reducing insurer costs through other certified shop best practices (such as going lean). Learn more about the technology increasingly found on the U.S. vehicle fleet and what it could mean from your shop during “The Impact of Advanced Vehicle Systems on Routine Repair Process and Procedure” and “The Hidden Dangers of Vehicle Technology, Improper Repair Methodology and Your Liabilities” Nov. 2 at the OEM Collision Repair Technology Summit during the SEMA Show in Las Vegas. Space will be limited; early registration is encouraged. 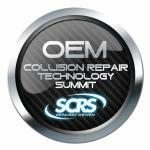 The sessions are part of the Society of Collision Repair Specialists Repairer Driven Education Series Oct. 30-Nov. 3. Register here for the three OEM Summit classes or the series pass package deal, which includes the entire week of classes, all three parts of the OEM Summit and the Nov. 2 Sky Villa afterparty. Asked why BMW demands collision repairers rivet vehicles that the automaker welded together in the factory, Fahlbush described it as a quality control technique. “We can basically confirm that the repair is done right and will hold up in a subsequent accident,” he said. Directing shops to bond and rivet vehicles might produce a more consistent outcome than hoping various repairers across the country weld the cars correctly and identically. “It takes out a lot of the guesswork in terms of ‘Are my weld penetrations good enough, was my welder set up correctly that day, was I having a bad day, did I miss a spot’?” Fahlbush said. The other reason is corrosion protection, Fahlbush said. BMW conducted a 12-year test on corrosion of a bonded and riveted joint, and it proved “decisive” the area would receive adequate protection, he said. Want to try and fix the vinyl and leather trim inside a customer’s BMW? You can, but you’ll have to figure out how to do it yourself, Fahlbush said. The OEM doesn’t prohibit interior trim or leather repair, but it doesn’t have instructions on how to do so, he said. “It’s not against our practice in any particular sense,” he said. The next Guild 21 call will be Oct. 12 at 2 p.m. Eastern and feature George Avery of AveryKnows, formerly of State Farm. Register here.